16 February 2016: For the first time astronomers were able to analyse the atmosphere of an exoplanet in the class known as super-Earths. 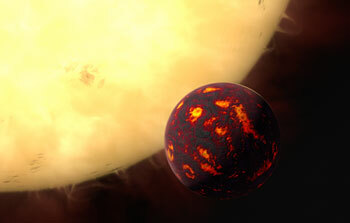 Using data gathered with the NASA/ESA Hubble Space Telescope and new analysis techniques, the exoplanet 55 Cancri e is revealed to have a dry atmosphere without any indications of water vapour. The results, to be published in the Astrophysical Journal, indicate that the atmosphere consists mainly of hydrogen and helium. 11 February 2016: The placid appearance of NGC 4889 can fool the unsuspecting observer. 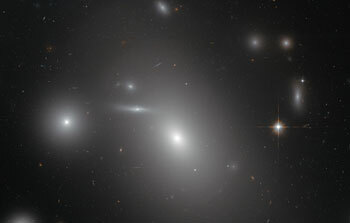 But the elliptical galaxy, pictured in this new image from the NASA/ESA Hubble Space Telescope, harbours a dark secret. At its heart lurks one of the most massive black holes ever discovered. 21 January 2016: Single stars are often overlooked in favour of their larger cosmic cousins — but when they join forces, they create truly breathtaking scenes to rival even the most glowing of nebulae or swirling of galaxies. 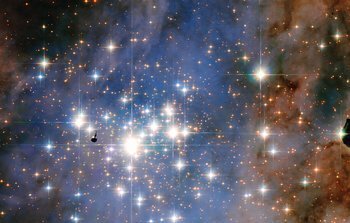 This NASA/ESA Hubble Space Telescope image features the star cluster Trumpler 14. One of the largest gatherings of hot, massive and bright stars in the Milky Way, this cluster houses some of the most luminous stars in our entire galaxy.